A neighbor is at Cambridge Village of Apex, so we went to see him, and I was very impressed with this community. It is quite expensive, but it's a good size place. They offer everything. They have doctors and medical assistants. My neighbor has been very pleased with it. I thought it was very nice. It seems like a high-end place. Cambridge Village of Apex is a new facility that is adding buildings. The main complaint my mom has had is the food. They have a new food service, which is more restaurant style, and are trying to work on the food. She likes it a lot. It is nice and bright. She is on the fourth floor in a studio, which she didn’t think she wanted, but she took it because there wasn’t a one-bedroom available after waiting for three or four months. She has made lots of friends in that hall, and she didn’t want to move, so she was happy where she was. Everything has been really good. They have what they call supported care, and they tell you upfront that it is not assisted living. They have one hall in one building where they will help you with dressing and medication and stuff like that. They are not certified assisted living and insurance won’t pay for that. Cambridge Village of Apex's facilities are dependent on the care coming to the client. They don't move them to assisted living. I liked the apartments, and the place is updated. They have a wellness center and a heated pool. I liked the fact that they had a lot of classes, exercise, and water activities. I just wished their apartments were more open with a patio and more natural light. My mom is living in Cambridge Village of Apex. It is a wonderful community indeed. The staff is caring for the residents. The food is very good, and there is a lot of variety for the residents. The chef does a good job. They also provide a lot of activities for the residents to keep them active and interactive with each other. They have a movie theater and a swimming pool and take trips. There is something for everyone. It gets the residents out of their apartments to do some fun things. Cambridge Village was a very nice place with a lot of amenities. The people were very welcoming. Cambridge Village of Apex is beautiful. It is a great place. The only difference is that it is not close to me. My best friend has her parent there. They have the same kind of amenities as with the other facility. It is very pretty. They have a pool and a gym. The people at Cambridge Village seem nice. The food is OK. Everyone is very friendly and willing to help. The apartment is very spacious. They have a full kitchen, washer and dryer, two bedrooms, and it's very nice. They have bingo, theater, and outdoor activities. It's also close to where I live, just 10 minutes away. That was very important for us. It's clean, people seem friendly, and it's not very strict, so I like that. Cambridge was close to us and it was cheaper. Mom was really excited about the activities. They have an indoor pool and activities all the time. What are some recent off-site events that the community activity director at Cambridge Village of Apex has organized? Went to see the Wizard of Oz, Jordan Lake boat trip, NC Aquarium and Fort Fisher, clean comedy show at the Halle Cultural Arts Center. What makes the chef or dining program at Cambridge Village of Apex exceptional? What kind of menu can independent living residents expect? We make everything from scratch and have a full menu just like a restaurant. If Cambridge Village of Apex accepts dogs or cats, what indoor/outdoor areas can they enjoy? Our walkway around the pond that is a 1/4 mile. We are also going to be building a dog park! Does Cambridge Village of Apex work with an agency or registry to provide nursing and medical assistance as needed? Stay Active. Have fun. Live a Life Fulfilled. At Cambridge Village of Apex, we take a holistic approach to your health and well-being: physical, emotional, spiritual, and mental. The activities you'll discover here include wellness programs, outings, cards, board games, Wii, arts and crafts, educational classes, veteran's events, and church services. And our 10,000-square-foot wellness center and health club lets residents and members get professional guidance from WakeMed Healthworks Fitness & Wellness staff through carefully planned recovery programs, as well as routine exercise regimens to prevent injuries. It is our contention that physical activity helps optimize our residents' ability to maintain independence. Don't forget to view our Clubhouse that boasts a formal dining room, activity rooms, a chapel/theater, a library, lounge, café, and pub. Or take a trip over to the spa and reap the benefits of myriad services for respite and relaxation. Achieve Happiness with Peace of Mind. Many seniors position safety high on their list of priorities. 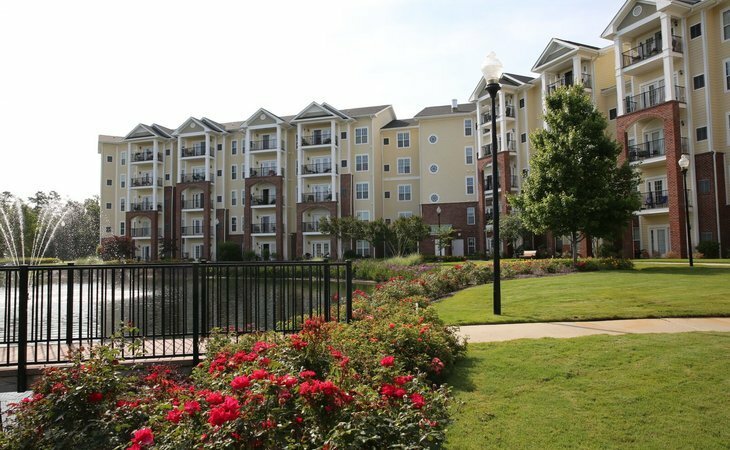 At Cambridge Village of Apex, we offer 24-hour staffing to ensure a sense of safety and security. Additionally, physical therapy and occupational therapy are provided by WakeMed Physicians Practices, supportive care options, and Primary Care Services through PrimeMD. While we all want to remain independent as long as possible, it is also important to know that you can get more care, if you need it, without having to move. This is what Cambridge Village Enhanced Supportive Cares Services provided by WakeMed are all about. Offering the levels of care that you need, when and if you need it. This offers you the peace of mind knowing that extra care is available, without leaving the community. This pay as you go format also relieves you of the worry of having to pay for care before the need arises. What should caregivers and potential residents know about Cambridge Village of Apex?